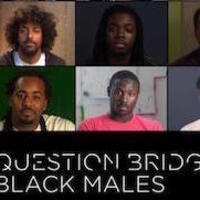 Question Bridge: Black Males by artists Chris Johnson and Hank Willis Thomas in collaboration with Bayeté Ross Smith and Kamal Sinclair, is an innovative, widely exhibited transmedia project that uses video to facilitate conversations among Black men across the United States. Question Bridge is presented by the Mary Porter Sesnon Art Gallery, February 6- April 6, 2019. Gallery hours and directions can be found here.